I have an aversion to buzzwords. This aversion stems from the fact that they take perfectly good, functional terms and debase them to a point where they no longer have any specific meaning. Once they enter popular lexicon it's virtually impossible to check their progress; isolated cases of misapplication rapidly instigate a domino effect, and before you know it the word has lost much of its original value. An earlier article on the recent proliferation of the term 'reboot' covered some of this ground – although that case is unusual in that there seems to have been no consensus on what the word meant in the first place – but I feel an unconquerable urge to return to the subject in relation to misuse of a far more enduring term, which is the word 'dystopia' and its various conjugations. This is an evocative word, and one that people are understandably fond of using, but increasingly I seem to come across instances of application which dilute or misrepresent its rather unique meaning. More than anything else, this article is intended to be a personal rationalisation, explaining what the term dystopia designates to me as an individual, with the hope that it might inspire others to do the same. Without resorting to an encyclopaedic citation, there is some background information which is essential to this discussion. Briefly, the necessary points to bear in mind are a) that the word 'dystopia' was coined as an antonym of 'utopia', b) that the word 'utopia' was itself not coined until the fifteenth century, in a philosophical work of the same name by Sir Thomas More, and c) that by the time 'dystopia' was coined, the generally accepted meaning of 'utopia' had divurged from its own original meaning. The last of these points is critical only insofar as it negates the viability of looking directly to More in order to define the meaning of 'dystopia'. Otherwise, it is sufficient to acknowledge the fact that there are two definitions of 'utopia', the first relating primarily to its original use, and the second, more commonly accepted and widely applied meaning. Of these two only the latter concerns us here. So what does 'utopia' mean? Generally, when we use the word 'utopia' it carries connotations of perfection, total fulfilment, or an ideal state. The last is particularly important in regard to its alternative possible meaning: not as a static mode of being, but as 'the State' of proverbial socio-political significance. The word 'utopia' is not synonymous with others like 'paradise', which tend to suggest a simpler way of life, devoid of negative aspects because they forgo complexity. Paradise is certainly what any true utopia would deliver, but the means of reaching that goal relies on perfecting each individual facet in a finely-tuned machine, rather than dismantling it in order to get back to basics. In other words, a utopian world is one in which society works flawlessly for the satisfaction and betterment of its people, at once delivering and being an ideal state. Utopia is thus a means of attaining paradise, but not all paradises are utopian. The paradise of the Bible, for instance, is not utopian simply because it requires more than two individuals to constitute a society. So what does 'dystopia' mean? First of all, it's worth noting the unusual spelling. The much more common dis- prefix would result in a negating reversal of the term 'utopia', but instead we have the rarer dys-, which carries a much stronger connotation of actual negative traits, rather than simple mirror opposition. 'Dysfunction', for instance, denotes the aberrant operation of a system or machine, not the cessation of function itself. Indeed, regardless of the actual etymology of the term, it would not be improper to treat 'dystopia' as a contraction of 'dysfunctional-utopia', which suggests a much clearer definition without altering the proper meaning. If we define a utopia as a social system which promotes the value and well-being of its citizens, then a dystopia is surely a similar system whose function produces the equivalent negative affect, i.e. the exploitation and devaluation of individual rights for the benefit of the state. Just as there must be a society in order for their to be a utopia, the same is also true of a dystopia. At their heart, each is quintessentially defined through the relationship between individuals and a state or social system of which they are a part, the latter existing for the benefit of the former in a utopia, and the former used to serve the latter in a dystopia. So what are some examples? A bleak horizon, but is it dystopian? One of the more frequent misapplications in recent weeks has been in relation to the Terminator franchise. If we use the definition outlined above, however, this error is clear for two reasons, being a) that the pivotal event of Judgement Day obliterated much of human society, and b) that the small numbers who did survive have actually formed a social order in which the value of human life is paramount. While these survivors certainly endure a harsh existence, as part of a martial society necessitated by the threat of annihilation, theirs is nevertheless a system that not only work but also affirms the value of each human being against that of their enemies, the machines. This is representative of by far the most common misapplication of the term dystopia, whereby it is perceived as being synonymous with any post-apocalyptic world. 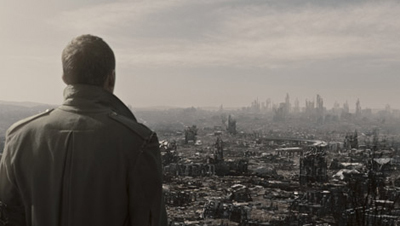 The world of Judge Dredd, by contrast, is a proper example of both, where catastrophic events have resulted in the creation of huge, overpopulated enclaves. The ensuing upsurge in conflict and crime sees the introduction of a harsh system of justice arbitrated without the right of appeal, with the end result being a pronounced decline both in the quality of human life and its perceived value. It's also important to bear in mind that fictional worlds need not be either dystopian or utopian in their entirety, and yet still feature one, the other, or both. The Star Trek series is perhaps the most ready example, for although it depicts a universe in a state of ongoing inter-species conflict, human society on its own has made great advances toward a state of utopia by abolishing money, achieving real equality in terms of race and gender, and embracing a system of utility whereby an individual's role is dictated by their aptitude and abilities. The original Stargate film depicts the reverse, where a team of realistic modern extraction makes contact with a human society utterly bent to the will of a despotic alien overlord whose effort to maintain their oppression includes banning all literacy. The truth is, the amount of dystopian or utopian societies that can exist in any work of fiction is limited only by the number of distinct states or equivalent social orders which feature in it overall. Of course, there is nothing which dictates that a society need be either wholly utopian or dystopian. It is more accurate and far more practical to imagine a delineated scale extending between these two poles, with each example falling more or less to one side or the other. This brings me to what will not doubt prove to be a controversial case, which is the film Blade Runner. In terms of presenting a speculative vision of the near future, this film is almost without equal. Unfortunately I cannot be as resolute about the common perception that this vision is dystopian. What we see of the year 2019 is certainly far from utopian, but so fleeting and restricted is this exposure that we should be hesitant before leaping to the opposite conclusion. It is a world in which morally bankrupt corporations are shown to unleash horrors upon the general populace and their own creations alike, of over-crowded streets bathed in the garish light and incessant noise of mass-advertisement, filled with poverty and greed, injustice and suffering. But is this substantially different from the world we live in today? In fact, one could argue that the core of Blade Runner's success in presenting a captivating, believable future derives from the fact that it merely reflects current society, with all its positive and negative attributes, and magnifies them. The corporations may be bigger, the builders taller, the streets more crowded, but in terms of the underlying dynamics it all feels so intuitively familiar.